Lamb and potatoes have a natural affinity, as we saw in the elegant côtes d’agneau Champvallon. 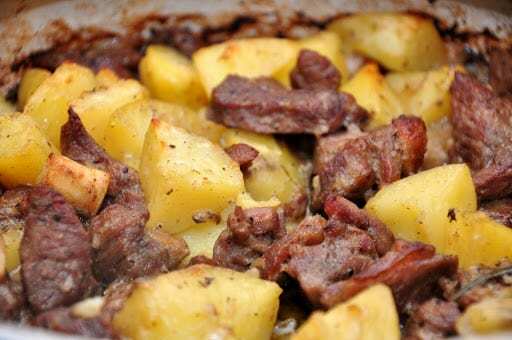 Here is a more rustic dish, made with seasoned chunks of lamb and potatoes baked in the oven until nicely browned on top. Simple, hearty and satisfying. Take some thickly cut shoulder lamb chops, one or two per person depending on whether you are serving other courses and the appetite of your dinner companions. Bone and trim the chops of excess fat. (NB: Don’t try to remove all the fat, just the really thick swaths of it. You want some fat to moisturize the meat during its rather long cooking time.) Cut the meat into cubes and add to a large mixing bowl. Then add a healthy splash of white wine, a pour of olive oil, one medium sliced onion, fresh rosemary, salt and pepper, and mix the ingredients well. If you have the time, allow the meat to marinate in this mixture for at least an hour and up to a day ahead. When you are ready to cook, add chunks of potato, about the same size of the lamb cubes. Use as much potato as you like; I find that a 1:1 ratio of potato to lamb meat by weight produces a fine result. Mix the potatoes and lamb meat, then pour the entire mixture into a baking dish large enough to hold it all without it coming, say, any more than 5cm (3 in) up the sides of the dish. Bake in a hot oven (200°C, 400°F) for about a half an hour covered, then remove the cover, raise the heat a bit and allow the casserole to continue cooking until the lamb and potatoes are tender and nicely browned, about 30 minutes more. The lamb will have shed quite a bit of water in the first half of cooking; the liquid should evaporate, but not quite completely, by the time it is done. Mix the lamb and potatoes from time to time to baste and allow the pieces to cook evenly, but leave the dish alone for the last 15 minutes or so, so a nice brown crust forms on top. If you find that the lamb has given off a lot of grease, you can skim the excess off with a spoon but, once again, do not skim all of the fat off, as it provides both moisture and flavor. When the dish is done, remove it from the oven and allow it to cool and settle for a few minutes before eating. It can be made ahead and re-heated as well, and only improves if you do so. If you don’t want to take the trouble to bone lamb shoulder chops, you can, of course, simply buy pre-cut lamb ‘stew meat’ (about 250g or 1/2lb. of meat per person should do) but try to ascertain whether the meat is shoulder or leg. Shoulder has more marbling and is far better for long cooking. Leg of lamb tends to be too lean for stewing, in my opinion, and is best roasted. And it costs more as well. The potatoes need to be the firm fleshed ‘waxy’ kind, or all-purpose. Avoid baking potatoes, which will fall apart in the cooking and turn to mush. Otherwise, the recipe is just about foolproof. The dish is usually served as a secondo but is hearty enough to serve as a piatto unico, rounded out with just a salad and a piece of fruit. This dish was a great hit at a recent dinner at our place–even some finicky kids and adults who usually don’t like lamb, loved this dish! Angelina made a similar lamb and potato dish, but using shoulder chops with the bone still on, mixed with a bit of tomato and pecorino cheese—and omitting the white wine or rosemary. Cut up chicken is wonderful made the same way. Take some thickly cut shoulder lamb chops, one or two per person depending on whether you are serving other courses and the appetite of your dinner companions. Bone and trim the chops of excess fat. (NB: Don't try to remove all the fat, just the really thick swaths of it. You want some fat to moisturize the meat during its rather long cooking time.) Cut the meat into cubes and add to a large mixing bowl. Then add a healthy splash of white wine, a pour of olive oil, one medium sliced onion, fresh rosemary, salt and pepper, and mix the ingredients well. If you have the time, allow the meat to marinate in this mixture for at least an hour and up to a day ahead. I love your site. Your recipes always make me want to cook! This one — I substituted yams for the potatoes (can't eat nightshade vegetables right now), upped the onions and voila. DELICIOUSNESS. Thanks, guys! It's a humble, homely dish, but really good eating. Definitely worth a try! This sounds great I cant wait to try this. We always prepare potato with beef but never with lamb, always thought the flavor would be to overpowering but it looks so good. I will need to try this next time. How beautiful and delicious this dish is, for all its simplicity! My husband and I love lamb but I have been stuck preparing it the same way over and over again. This dish will be a welcome addition!